Assuming you're not trying to put shocks on the machine, go kart steering systems are fairly straightforward. Basically, the steering wheel will attach to the steering rod and terminate at the Pitman arm. 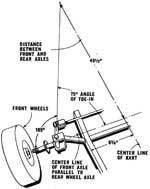 This arm will push the tie rods in either direction, which turns the wheels by pushing on the wheel spindle arms. Make sure that you spend plenty of time making sure the steering is safe, and that your nuts and bolts are secured and properly sized. You might look to a free solution from a junked mower. You can buy a round one from a supplier that's chromed for around $20. They also carry butterfly styled steering wheels as well. However, if you're looking to get creative, consider that your wheel doesn't need to be traditional shaped. The one in the photo is solid bar that's been bent to shape. Check prices on steering wheels at Northern Tools. You want to make sure that your tie rods and spindles are stout enough to take some abuse, and won't easily bend out of shape. We used 1/8" materal for the Pitman arm once, and though it would probably work, we replaced it with 1/4" since we were concerned that a misplaced step might bend them. There's no reason not to make the steering very sturdy. 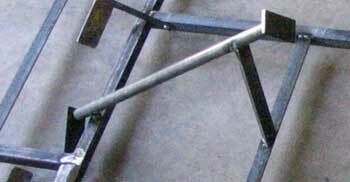 Tie rods and steering shaft are 3/8 as well, and the steering shaft is sheathed for extra protection. For the steering tube and rod assembly, we found that proper 3/8" bushings were difficult to find at the hardware store. Instead we used these faucet seats, drilled the centers out to 3/8", and pounded them into the larger pipe for a tight press fit. You could further silver solder them if they were loose. 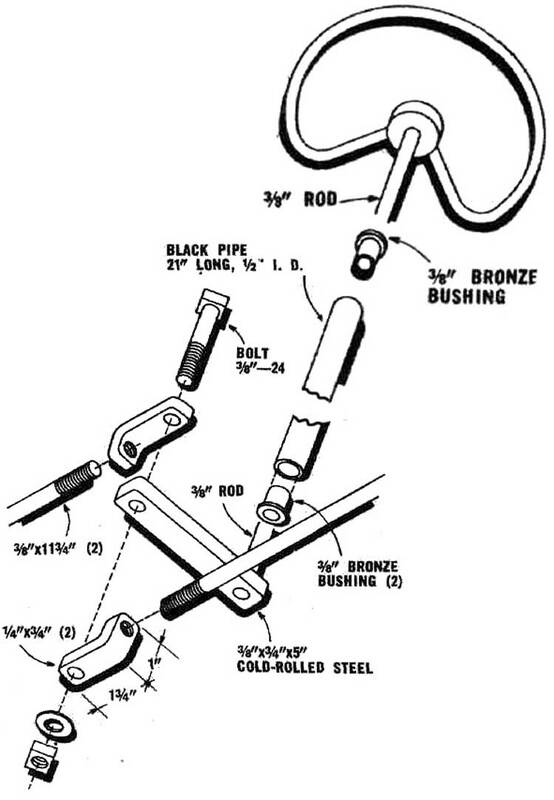 The pic below shows the steering rod/Pitman arm assembly. 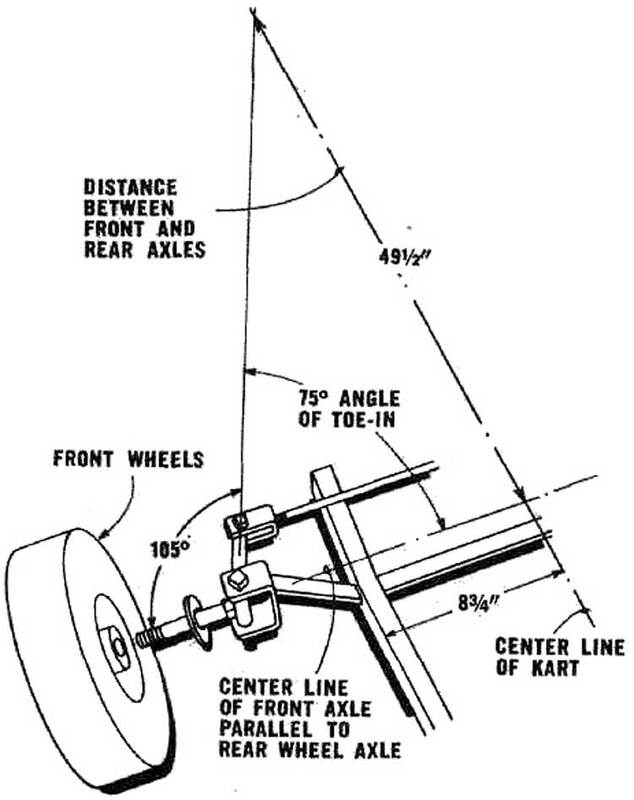 The tie rods attach at the Pitman arms and connect to the wheel spindle arms. You could also buy the arm, but there's little reason. As you can see it's simply a piece of 1/4" bar. 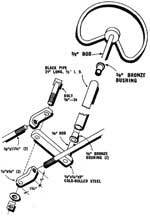 Check prices on tie rods at Northern Tools.